An updated version of this post, which covers uWSGI 2.0.9 and Python 3.4 is available here. In a departure from what I often write about, I'm going to talk a little bit about something that is tangentially related to what I actually do for a living: running a web server. So I'm going to give a brief tutorial on setting up uWSGI (in Emperor mode) and Nginx so that you can run one or more Python Flask instances on a server. ...this was ungainly, running multiple Werkzeug instances was inefficient, I didn't want to have to forward all of those ports, and damn it, I wanted to do things right. But, as this isn't my area of expertise, it took me a while to put all of these pieces together, because many of the examples that I was able to find were light on the details. I'm putting this here in the hope that someone else in my situation might find it useful. The goal here is to run multiple Flask servers on one machine without having to worry about port numbers and the like. We'll start with just one, and I'm sure that you can figure the rest out from there. First you need a Flask application to run. How about this one? I wrote it a few months ago because I wanted to translate GET requests to POST requests. Navigate to the directory you'd like to install it to (probably /opt/ or /var/www/), then clone it. You'll want to verify that it runs locally on its own first. In a web browser on the same server, navigate to http://localhost:9999 and verify that the application is accessible. If you're running headless (as I am) you can always spawn the process to the background with post/run.py & and then curl localhost:9999 and verify that you don't get an error back. You can now kill the Python process. Flask is now set up! In this case, run is the name of the Python source file that contains our application (/opt/post/run.py) and app is the name of the Werkzeug/Flask application object contained in that file. Verify that the application is accessible again from http://localhost:9999 as above. You can change the location of the Emperor's log file by changing the LOGTO environment variable. You can also modify which user (--uid) and group (--gid) the Emperor will run as. Here, base is the base directory of our application (the directory that contains the module we want to run), app contains the name of the module to run (in this case run, for run.py), callable is the name of the Werkzeug/Flask callable application object (if you don't supply this, uWSGI will assume that it's called application), and socket defines the location of the socket you'd like Nginx to use when communicating with your uWSGI server. The %n references the name of our file (sans extension) to maintain consistency. You'll need to ensure that the location of your sockets (in this case, /opt/run/) exists and that the appropriate user (in this case, www-data) has write permissions. As soon as your Emperor process sees an application configuration file in apps-enabled it will start up a uWSGI instance to serve requests for that application. If you'd like to set up additional Flask applications at this time, simply install them and create uWSGI configuration files for each (and don't forget to link them to apps-enabled!). If you're having trouble, take a look at the logs. The uWSGI Emperor is now set up! # server unix:///path/to/your/site.sock; # For a file socket. # server 127.0.0.1:9999;                 # For a port. Once you're done, create a soft link to /etc/nginx/sites-enabled/ for each of the entries in /etc/nginx/sites-available/. Now you can start your Nginx service. 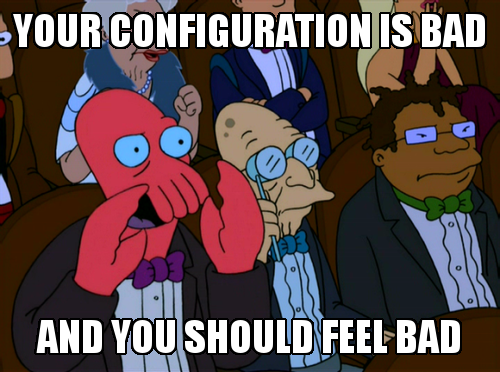 Every time you modify the Nginx configuration file, you'll have to restart the it. If you're running this server from your home or office and you need external access, don't forgot to forward port 80 so that Nginx is accessible. Instructions for your router are probably available here. I also had some help from my friends and colleagues BCJ and Curtis when I was initially setting up Nginx. Thanks, gents!